Del Monte Fresh Produce NA Inc. recalled almost 60,000 cantaloupes sold through warehouse clubs in seven states because they may be linked to a 12-case outbreak of salmonella, the company said through the U.S. Food and Drug Administration. Del Monte Fresh said the recall came after the FDA notified it of a link between the cantaloupes and the salmonella outbreak. The Coral Gables, Fla.-based company put its production and distribution of the fruit -- grown on Del Monte Fresh's farm, Asuncion Mita in Guatemala -- on hold while it and the FDA investigate what caused the problem.The U.S. Centers for Disease Control said the 12 consumers sickened in the salmonella outbreak ranged in age of less than a year old to 68 years old and were in four states -- Oregon with five cases, Washington with four cases, California with two and Maryland with a single case. Of those sickened between Feb. 5 and Feb. 23, two had to be hospitalized. During the outbreak investigation, authorities found that 11 said they ate cantaloupe in the week before getting sick and 10 reported buying the fruit at warehouse club locations. The CDC used membership records to determine the cantaloupes came from the same farm. A source of the contamination has yet to be found. A salmonella infection can cause serious and potentially life-threatening infections in young children, those with weakened immune systems and the elderly. Normally healthy people can suffer diarrhea, nausea and stomach pain. The salmonella panama strain, which, as its name suggests, has been reported in several Latin American countries, has demonstrated resistance to antibiotic treatment. 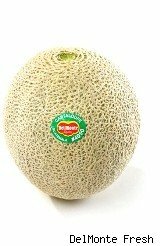 Del Monte Fresh said the cantaloupes were distributed in 4,992 cases through warehouse clubs in Alaska, California, Colorado, Idaho, Montana, Oregon and Washington and sold between March 10 and Monday, March 21. The cantaloupes were packed in beige plastic mesh sleeves containing three cantaloupes and sealed with a plastic orange handle with the Del Monte logo. The fruit has the lot codes of 02-15-24-10, 02-15-25-10, 02-15-26-10 and 02-15-28-10. The company made a similar recall of cantaloupes grown in Arizona and distributed in Detroit in October 2010. Consumers who have any of the recalled fruit should return it to the store for a refund. Contact Del Monte Fresh at (800) 659-6500. A few more recent salmonella outbreaks occurred in alfalfa sprouts, and at Taco Bell and Subway restaurants.